Are you wondering where to stay at Machu Picchu or which places are the best Machu Picchu hotels? There are three common areas travelers stay in when visiting the sacred site of Machu Picchu: Cusco, the Sacred Valley, or Aguas Calientes. Hands-down, the best place to stay is Aguas Calientes. Just a short bus ride down the mountainside from Machu Picchu, staying in this small town means you’ll spend less time en route to Machu Picchu the day of your visit, and, therefore, more time at what is undoubtedly one of the most majestic and inspiring sites in the world. Now that you know where to stay, the question remains, what’s the best hotel in Aguas Calientes? We compare the top five places to stay during your visit to Machu Picchu. Although not your shiny, new, or modern luxury hotel, Machu Picchu Pueblo Hotel is a slice of heaven with its authentic cabañas surrounded by the lush, green cloud forest, beautiful gardens, and teeming with birdlife. Take a dip in the semi-natural thermal pools after your long day of hiking, or unwind in its unique Andean Sauna heated with hot stones from the river. After dinner (included in the rate) at its fantastic restaurant, finish the evening relaxing in front of your fireplace and toasting to your adventures. If staying two nights, you may also have time to take advantage of their included on-site excursions like a morning bird-watching walk around the property, learning to make Peruvian tea, or visiting their spectacled bear rehabilitation project. If you’re looking for more of a traditional 5-star hotel, then Sumaq is an excellent choice. It’s well located along the river, but further away form the train station to avoid any noise. Where Sumaq really shines above its competition is the phenomenal restaurant: it’s the best meal in Aguas Calientes. For those who prefer a smaller, boutique-style hotel, Casa Del Sol is the place for you. Book a suite with the private, in-room Jacuzzi facing the river. The views of the river and surrounding cloud forest make it a wonderful place for a relaxing bath after your Inca Trail hike or day of exploring Machu Picchu. There is only one property located right outside the entrance to Machu Picchu, and that is the Sanctuary Lodge. Based on its exclusive location, it doesn’t come cheap. You’ll be dropping about $1,000 a night to stay up the mountain at this hotel, and it isn’t nearly as nice as what you’ll get in Aguas Calientes, for a small fraction of the price. The rooms are quite small and the hotel is very restricted in terms of construction and updates they’re allowed to do so close to the site. It’s also important to note that it’s located in the parking lot of Machu Picchu where the busses will be turning around all day, and, despite some popular belief, you cannot see the site of Machu Picchu from the hotel. Regardless, it’s hard to argue with its location, just steps away from walking into Machu Picchu, and no other hotel in the country can have you sleeping that close to the marvelous site. The above properties are all in the 5-star price range. If you’re looking for a nice property, but a step down in price, consider Hatun Inti Boutique. The rooms are quite nice and spacious. Some rooms have fireplaces and lovely views of the river. It’s a great place to stay that won’t quite break the budget. With any hotel in Aguas Calientes, it’s important to remember that you’re always paying for the location. Don’t expect your per/night budget to get you quite as far in this town as elsewhere. HOW MANY NIGHTS SHOULD I BOOK? Now that you know where to stay, the final decision to make is how many nights to stay. Of course, due to its location, accommodations in Aguas Calientes are around 25% more expensive than the Sacred Valley or Cusco, so many visitors choose to stay there just one night. 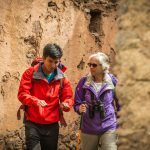 If you’re arriving by hiking the Inca Trail, choose a hike that has you arriving in the late afternoon when the site is clearing out of visitors and the light is best. Take in your first views of the site during this magical time, before heading down to town for a good night’s rest, a tasty meal, and to prepare to return the next day, well rested and ready to fully explore the site. Take a look at Knowmad’s Inca Trail & Beyond Trip Idea for a sample trip flow. If arriving by train, choose to stay in Aguas Calientes the night before to enjoy the morning hours at the site (Machu Picchu has two permit slots: 6 a.m. to 12 p.m. or 12 p.m. to 5:30 p.m.), or train that morning and enjoy the quieter afternoon hours at the site, staying that evening in town after your visit. If your time frame and budget allow it, stay both nights in town and purchase both a morning Machu Picchu + Huayna Picchu permit, and an afternoon Machu Picchu permit to fully explore and experience this marvel. Consider an itinerary like Knowmad’s Classic Machu Picchu that has you staying two nights in Aguas Calientes. Finally, any trip to the Southern Highlands of Peru is not complete without a stay in the Sacred Valley and Cusco as well. Plan to stay in the Sacred Valley first, the region between Cusco and Machu Picchu, where you’ll be at 9,000 ft. instead of Cusco’s daunting 12,000. Get off the beaten path in the valley, hiking to little-known ruins, biking past breathtaking countryside, and connecting with Peruvian tradition, culture, and its smaller communities. Finish your Southern Highlands trip in Cusco, where it all comes together with pre-Inca, Inca, colonial, and modern society all on display. You’ll be better acclimatized by then and prepared to explore the city. Give a Knowmad Peru Trip Specialist a call today at 612-315-2894 ext. 105 or email me at renee@knowmadadventures.com to find out where we most recommend staying in the Sacred Valley and Cusco, and begin planning your personalized Machu Picchu itinerary.